Hello there! Can you believe Halloween is just around the corner? Here in Indiana the air is getting crisper, and the leaves are beginning to change. The little trick-or-treaters will soon be ringing the doorbell. 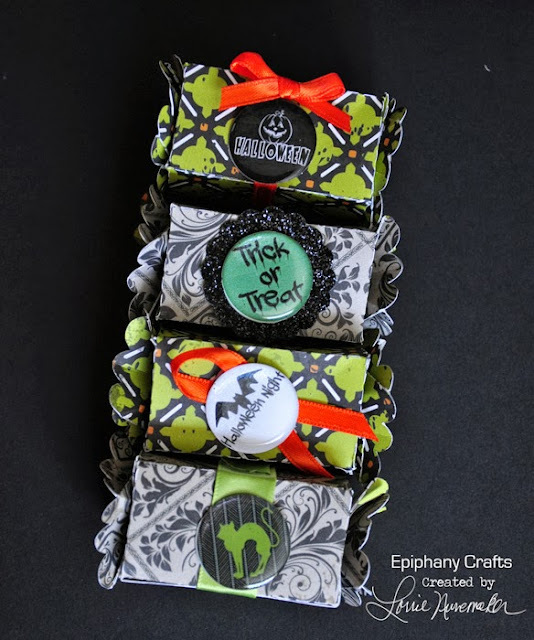 I've got the cutest little boxes to add a little pizzazz to their treats. I created the boxes using my Silhouette Cameo and a shape from the Silhouette store. The size is perfect to fit little minature candybars inside. I can also cut 4 boxes out of one 12 x 12 sheet of paper. The Epiphany Crafts Shape Studio Round 25 tool and bubble caps are the perfect size to add a little bling to the boxes.